2013 is proving a toughie for me so far. I think most carp anglers are struggling due to the horrible weather and never ending cold temperatures. I’ve looked at my 2012 catch records and I had caught 7 carp by the end of March. Most of these came in a very warm spell at the end of January. Strong South Westerly winds blew in some very unseasonal mild temperatures of 16˚C. I couldn’t resist such a combination and fished a deep swim on the end of the wind and bagged 4 carp topped by a brace of stunning mid 20 commons. After filling my boots I suggested that a friend, who until this point had failed to catch from the lake after 2 years, should move into the swim. He did and was subsequently delighted to land a beautifully conditioned mirror of 16lb. They were definitely having it. The memory of these captures is dominated by 2 things. Firstly, the condition of the fish was stunning, they looked simply breathtaking as the photo above demonstrates. Secondly, I was wearing a long sleeved t-shirt after dark whilst fishing on the end of the wind. Looking back it’s hard to believe that those conditions occurred in January! Here we are in 2013 in April and only now does it look like we may start to see some warmer weather. After this cold start to the year the fish won’t spawn until the end of September. It kind of makes a mockery of the close season. I’m joking about the fish spawning in September, of course, but this year’s campaign has been seriously hampered so far. I have fished many winter sessions on my local 65 acre pit (which from now on will be known as the farm lake) to absolutely no avail. I have coined a new phrase to describe these sessions – royal blanks. I didn’t see anything, I didn’t hear anything and I certainly didn’t catch anything. The winter fishing on the farm lake is complicated further by the constantly changing water levels as it’s connected to the River Ouse via a channel. As a result, to add insult to injury, my royal blanks have been worsened by waking up to flood conditions and rapidly disappearing bank sticks. To say that I barrowed my gear the mile home with my tail between my legs is an understatement! I’ve moved around the lake trying different swims in order to try and locate the carp. I’ve tried fishing near the inlet pipe when the water is entering the lake prior to a flood, but to no avail. This area is very fruitful in the summer and autumn when oxygen levels are lower but it seems to be home to some big perch that pick of shoals of silver fish as they enter the lake during the colder months. I’ve also fished the back of the wind, the end of the wind and close to the few weed beds I had identified in the summer months all resulting in more confidence sapping royal blanks. I have a suspicion that the carp may be holed up in a very deep hole that is well out of my casting range. I became aware of this spot after 2 pike anglers showed me it on the echo sounder attached to their bait boat. The lake bed plunges from 6ft to 24ft like a cliff face and then steadily trails upwards in a south westerly direction for 250 yds, eventually forming a bar of 4ft and then meeting a spit that splits one end of the lake into 2 large bays. To put this in context the farm lake is fairly featureless with average depths of about 8ft. If the carp are there then they are safe as I’m not a bait boat kind of guy. Perhaps I should stick to a better stocked smaller water in the winter. The farm lake has been flooded for the last 2 weeks so I have been unable to get out on the bank. I have spent my time preparing my bait assault for when things calm down. I like to use a mix of hemp and large particles which I combine with my own boilies. I generally use a mix of maize, sweetcorn, maples and chickpeas along with the hemp as I like the carp to be picking up different sized baits when feeding as the varying levels of suction required to take in the bait make the fish more catchable. 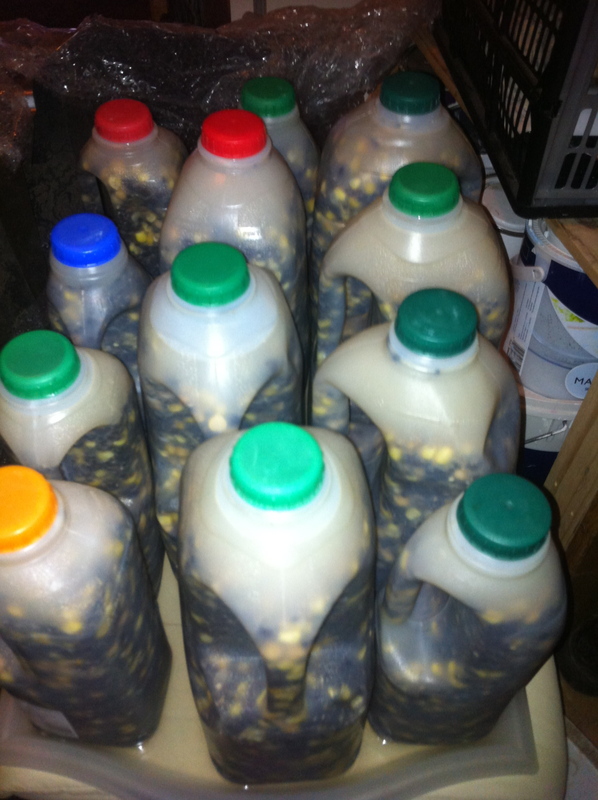 Once I have prepared and mixed the various particles I store and freeze the bait in old plastic milk bottles that I have cleaned in advance. This was suggested by a friend who was fed up with bagged particles sticking together and splitting in his freezer. The benefits of using milk bottles don’t stop there. I generally use a spomb to put my bait out if I’m fishing open water. The bait can be poured directly into the spomb from a milk bottle keeping things clean and tidy on the bank thus avoiding unwanted attention from swans and the beady eye of other anglers. 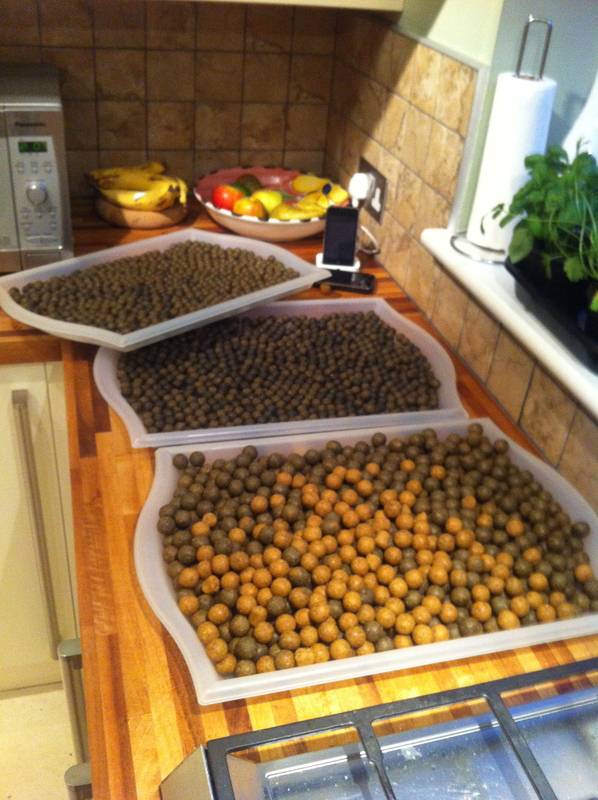 As I write this I have just finished making a batch of homemade boilies. I visited the farm lake earlier and started creating a heavily baited spot with particles and chops. I’ve mainly used singles so far this year but I do like the confidence that comes knowing there’s a bit of bait in the swim. The forecast for the weekend suggests we may see some south westerly winds so things are looking up, I only hope I get the chance to get out on the bank! This entry was posted in Carp Fishing, Fishing and tagged boilies, Carp, Carp fishing, Caught, common carp, Fish, hi-vis, Lake, March, MET Office, mirror carp, Particle baits, particles, September, Spawn (biology), spod, spomb, winter carping. Bookmark the permalink. Chin up fella. Go back to pure old fashion basics and bait. Keeping it simple is how I fish in the winter. Had a good read of your blog. Very good. I know maggot clips work well in the winter. A friend of mine fished a local lake and had twenty plus fish in february. I iwll stick a link on my website for you. Thanks John. I’ll return the favour if I can figure out a way to keep a static link in the menu section… glad you like it. I see yours is coming along nicely too. I also noticed you bagged a carp from Oxlode. Nice work! I’ve always been lucky John! Hello mate. Just to let you know I’ve got my links categories working on http://www.fenland-fishing.co.uk and added your site to it. Works a treat. Quite straight forward once cracked. I’ve also added a posts and comments page to my web site as well. Take a look. Speak to you soon.